I’m a huge fan of the Honolulu Museum of Art, and last week, I went with a friend. I’m a member of the museum and go there often, but this time, I went there with my blogger’s eyes and camera in tow, eager to bring back all of the best tips for you. A morning here is a morning well spent. As I wandered the galleries and drank my iced coffee in their outdoor cafe, I realized that there is something for everyone here. 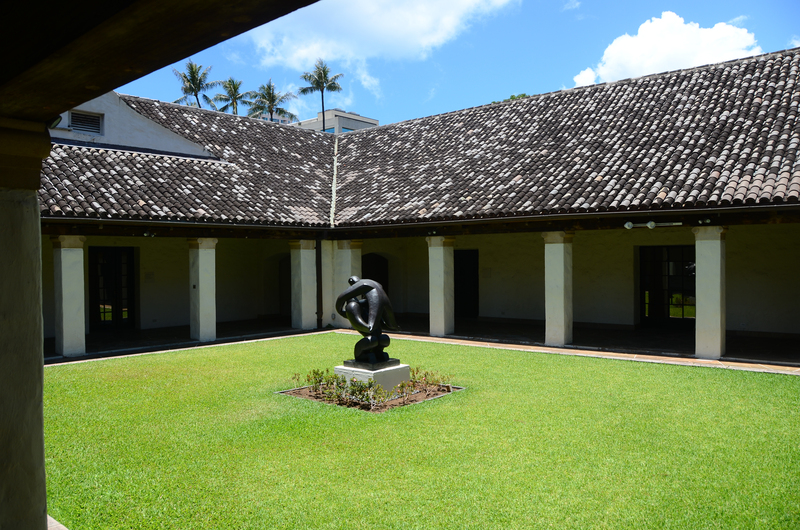 Whether you are a devoted art lover or a casual observer, you will find something to enjoy at the Honolulu Museum of Art. I always recommend that people have a few ideas of things to do on a rainy day here in Hawaii. That way, if the rain gets in the way of their beach or hiking plans, you don’t waste time, because you will know what else you want to do. I’d recommend the Honolulu Museum of Art as a great activity for a rainy-day, or even just a rainy afternoon. The museum itself is probably different from many museums you have been to. 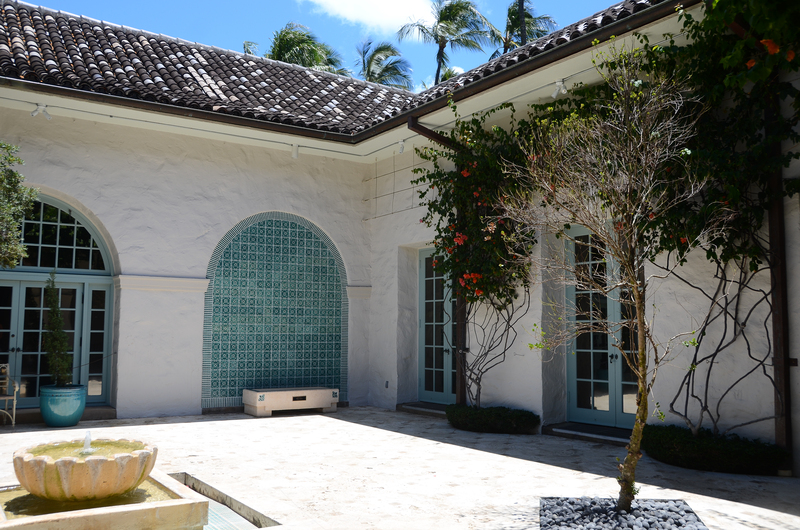 New York architect Bertram Goodhue designed the museum to take advantage of Hawaii’s natural light and the climate. So, the building also had outdoor courtyards. As you walk from one air-conditioned gallery to the next, you will walk outside and experience the loveliness of Hawaii. Aside from the galleries, much of the Honolulu Museum of Art is outdoors, taking advantage of the climate of Hawaii. There are so many different kinds of galleries here with, exhibits that change periodically. Spanning much of the globe and thousands of years of art, the mission of the museum is “to bring together great art and people to create a more harmonious, adaptable, and enjoyable society in Hawaii. When you enter, to the left are galleries of Chinese Art, Japanese Woodblock Prints, Japanese Art, Pan-Asian Buddhism, Arts of the Islamic World, Indian Art, Textiles, Indonesian Art, and Southeast Asian Art. On the right, you will find Antiquity and the Body, Medieval and Renaissance, Portraiture, 18th Century European Art, Impressionist and Post-Impressionist Art, Modernism, and temporary exhibitions. 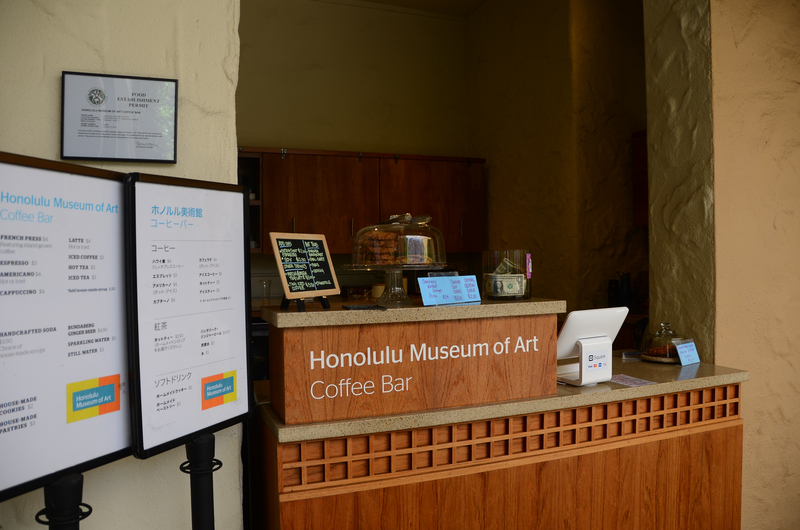 Behind the Cafe, you will find Arts of Hawaii, Contemporary Art, and Temporary Exhibitions. 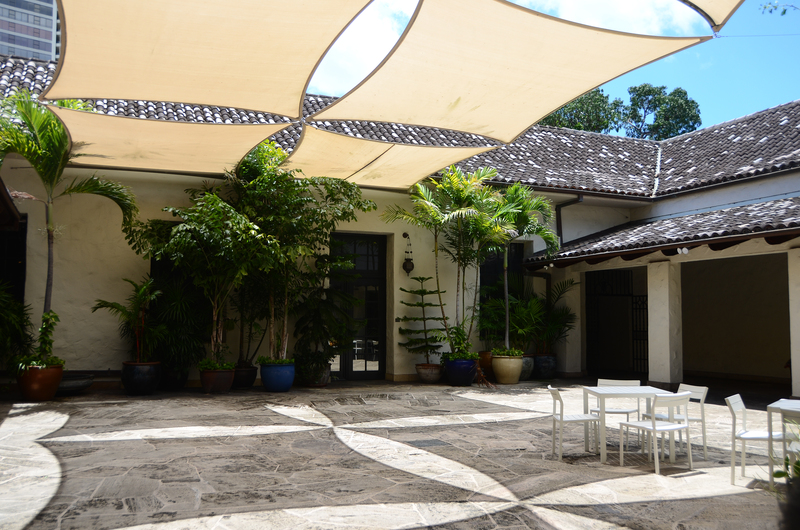 There are five outdoor courtyards scattered throughout the grounds that invite you to sit, relax, and enjoy the tranquility. 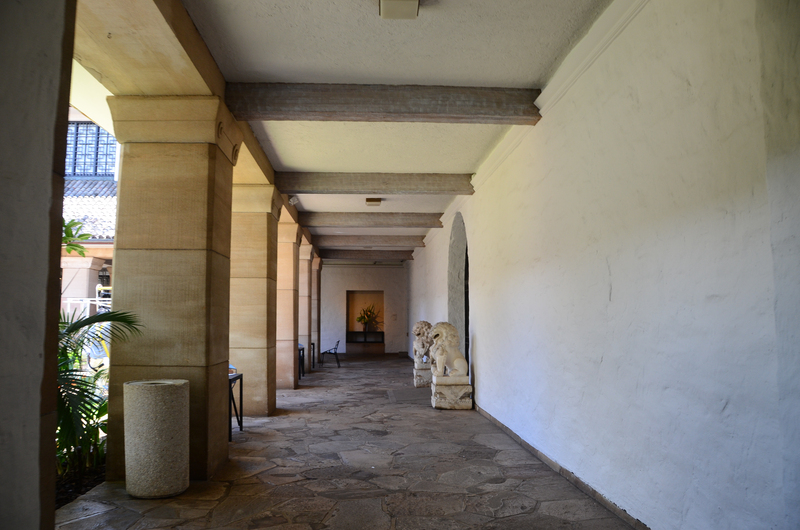 The Mediterranean Courtyard is one of five courtyards at the Honolulu Museum of Art. Hardly ever crowded, these beautiful spaces invite you to sit and relax. Let’s be honest, walking around a museum all day can be hard on your feet and pretty tiring. During my most recent visit, I stopped at the cafe for some water and an iced coffee after I explored a few of the galleries. The Coffee Bar at the Honolulu Museum of Art gave me a chance rest and provided the pick-me-up I needed to finish exploring. I loved the setting! You don’t feel like you are in Honolulu when you are sitting here! The open-air space where you can drink your coffee. Aside from the cafe, there is also an open-air café surrounded by gardens, a waterfall, and sculptures. Reservations are strongly recommended. The cafe serves a variety of salads, sandwiches, and small plates. If you just want to visit the cafe, you don’t have to pay a museum fee. The Honolulu Museum of Art Shop sells all kinds of books, stationery, prints, and posters that reflect the museum’s collections. Pro Tip: The shop also features items created by Hawaii designers and artists that you won’t find outside of the islands. I’ve bought lots of gifts there, and I think that it’s a great place to shop and find unique gifts to bring home! All proceeds go to support the Museum’s programs, so your purchase is also doing good. The Cafe hidden behind the bushes to the right is another oasis unto itself - it took be a few visits before I realized it was there! The museum is closed on Mondays. On Tuesdays-Saturdays, the museum is open from 10 am-4:30 pm. Sunday from 1-5 pm. The museum is closed New Year’s Day, July 4, Thanksgiving, and Christmas. Admission is $20 for adults. Ages 18 and under are free. Bank of Hawaii hosts Family Sundays on the third Sunday of the month; admission is free from 11am-5pm. Admission is also free on the first Wednesday of every month. If your trip’s itinerary lined up with these days, you could save a lot of money. Unlike many museums in Hawaii that have exhibits for children, like Bishop Museum, the Honolulu Museum of Art doesn’t offer anything specifically for children. With many statues and other large works of art out in the open, this might not be the best place for young children. However, strollers are permitted. Outside food and drink are not allowed. No food or drink is allowed in the galleries, but there is plenty of space in the open courtyards to enjoy a coffee. All bags larger than 16 inches in diameter must be checked in at the Visitor Information Centers. All galleries and facilities are wheelchair accessible. Courtesy wheelchairs are available at the museum’s entrance gates on Ward Avenue and Victoria Street free of charge. The Honolulu Museum of Art strives to make its facilities accessible to all patrons, so give them a call if you have any questions. 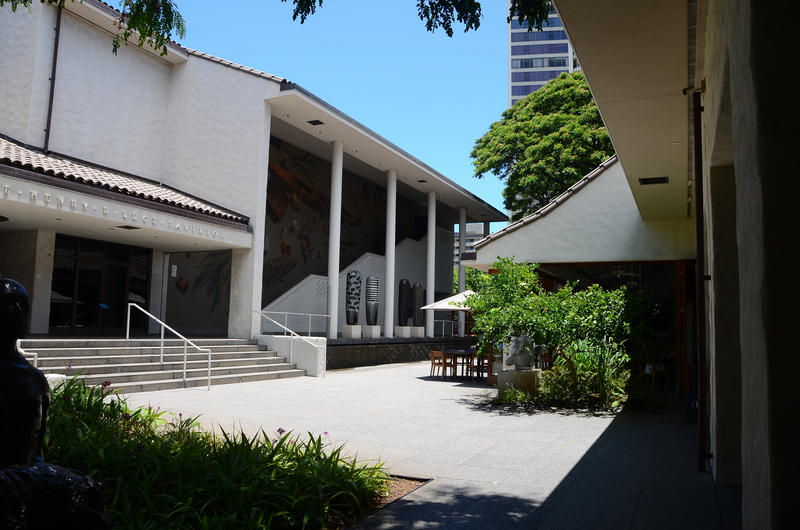 The Honolulu Museum of Art is a great way to learn about the culture of Hawaii. If you’re interested in learning more about the culture of Hawaii — and in seeing many important, sacred, and historical sights up close and personal — book a Hawaii Culture Tour through Hawaii Aloha Travel. Offered on Oahu, this tour will immerse you in Hawaiian culture and history. Especially important is that you will have a local tour guide who cannot wait to share their knowledge with you. What better way to learn about Hawaiian culture?